In this article I am going to explain the Sql server’s reverse function. In previous article I have explained how to create chart using Google chart API inMVC, how to create multiselect dropdown with checkbox using Bootstrapmultiselect Jquery plugin and how to populate and validate the Dropdowncheckboxcustom control in asp.net. 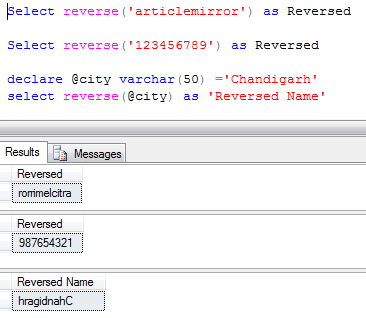 Sql server Reverse function used to get reverse order of string value.